Horse is just an oversized dog with funny paws... And Dog? Just a tiny baby horse with a weird tail. That's what Horse thinks, anyway. Elliot Kalan and Tim Miller team up in this comedy of mistaken species identity. Fall 2018, BALZER+BRAY. "Miller (Moo Moo in a Tutu), essentially charged with chronicling a comedy sketch, embraces the challenge by drawing Horse as a preening ovoid with stick legs and fabulous hair, and Dog as a belligerent series of sharp angles. He equips both with a repertoire of opera buffa gestures and expressions (utter disdain! indignation!) to great effect." "A wonderful read! 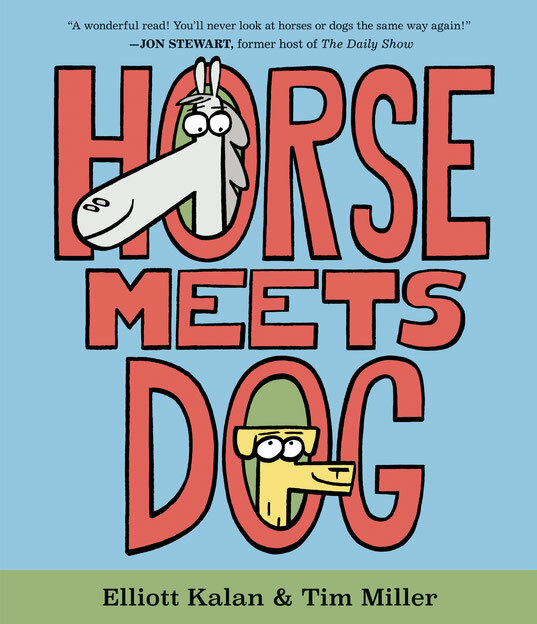 You'll never look at horse or dogs the same way again!" -JON STEWART, former host of The Daily Show.